Recently a major summer music camp decided to host a one-week session just for tuba players. First, they needed to attract the finest faculty they could to run the camp. Advertisements went out in the appropriate professional journals: Wanted, one administrator with appropriate academic credentials, doctorate required. Wanted, one classically trained tuba solo artist to present master classes in all areas of tuba performance and to present recitals of major repertoire composed for the tuba. Wanted, one tubist who can conduct classes in jazz improvisation and perform jazz oriented concerts demonstrating all aspects of jazz tuba performance from Dixieland to Big Band to BeBop. Wanted, one commercially successful tuba artist with experience in the major motion picture studios who can instruct and advise on the skills necessary to survive in this competitive market. Wanted, one tubist who has extensive experience performing the major orchestral and opera repertoire. Wanted, one tubist with experience in a premiere military band. Wanted, one tubist who can instruct and inspire students on the art of doubling on a number of different instruments. Wanted, one arranger/composer who can provide original repertoire for the individuals attending the camp. After an extensive search, a faculty was named and secured for the summer camp. The sponsors of the camp were especially pleased to learn they only needed to hire one individual to fill all eight positions: JIM SELF! We are here today to honor the individual who I consider the most versatile/complete tuba artist to ever hold the horn. Since his arrival at the University of Tennessee in 1969, forty years ago, we have been the best of friends. During his five-year tenure in Tennessee on most weekends, if Jim wasn’t visiting with me in Cookeville, I was visiting with him in Knoxville. These were the “early” days of the “tuba renaissance.” And we probably had too much fun exploring every conceivable opportunity to make tuba music together. Tennessee’s loss in 1974 when Jim moved to LA, was California’s and the world’s gain. The studios of Hollywood, the musical environment of Los Angeles, and the influential friendship he developed with the great Tommy Johnson, was what Jim needed to provide the impetus to develop into the world class tubist and musician he has become. No one has given more unselfishly of himself to his profession than Jim Self. His academic career, his motion picture studio career, his solo recording career, his past and continuing service to ITEA and now, his more and more successful endeavors as a serious composer, clearly identify Jim Self as one who has indeed honored us with a lifetime of achievement. At this time we would like to invite Matt Clemons from Yamaha to come forward to present a special award to Jim. We’ve asked Jim to put together a brief presentation highlighting his many accomplishments with his career in Hollywood. so distinguished that he is widely recognized as the most versatile tubist who has ever lived! His academic career has taken him from the University of Tennessee to the University of Southern California with a number of other impressive affiliations along the way representing a forty-year commitment to excellence in higher education instruction. Just based on the fact that he has performed on over 1400 motion picture soundtracks makes him probably the most “heard” tubist in history! Imagine that his work, which includes numerous “blockbusters,” have been experienced by millions from every corner of the globe! Jim’s 30-plus-year career as a “first call” tubist for such composers as John Williams, James Horner, James Newton Howard, and many others is based solely on his reputation as one of Hollywood’s finest, which also means one of the world’s finest! The National Association of Recording Arts and Sciences has awarded Jim their most prestigious honor, Most Valuable Player Award, three times! Jim has also pursued his solo recording career with a determination rarely seen in the world of low brass. Since 1983, Jim has produced ten solo recordings representing virtually every style of music known to man! Not being content with reaching the highest levels of accomplishment as a classically trained musician, Jim decided not just to “play” jazz but to learn it inside out. His most recent recordings have been reviewed by objective listeners as jazz at its best earning him a spot on the famous Downbeat Critics Poll. 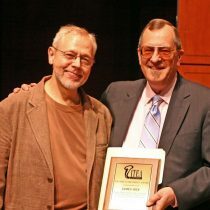 As is evident by the program that has been presented as part of this ITEA Lifetime Achievement Award Ceremony, Jim Self is not content to be “just a tuba player.” His career as a serious arranger and composer has more than blossomed in recent years. With at least thirty-five compositions to his credit, this aspect of his career has been recently celebrated with a major commission by the Pacific Symphony Orchestra for a full thirteen-minute orchestral composition that was just premiered to great reviews. The International Tuba Euphonium Association takes pride in bestowing this honor on a great man and former ITEA president. Jim Self is one of the greatest by every measure and, ultimately, it is ITEA that is honored by his continuing support.